Just moments before Michael Bisping (Pictured) tipped the scales on Friday, the UFC middleweight told all the fans inside the Chicago Theater in Illinois that he believed they were #1. Unfortunately for MMA ELITE CEO Alden Halpern and his popular clothing company, Bisping did so by using both of his middle fingers. “I must apologize to all of our fans. After sponsoring Bisping he flips off fans at weigh in. He will never be sponsored by us again!” Halpern tweeted immediately after the incident. “The UFC is on its way to becoming the greatest sports organization ever… I only want the best for the fans. 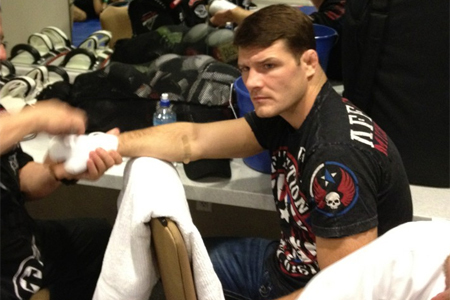 However, after having a brief discussion with the controversial 185-pounder about flipping the double bird, Halpern was convinced that it was all an act and he decided to keep Bisping on his payroll. “I must humbly say that I jumped the gun on Michael Bisping. I just spoke to him and he truly is a gentleman,” Halpern posted a couple of hours later. “What I was concerned about is not what he is truly about. Although I do not endorse the finger, his intentions are not of bad intent but a persona. Halpern shouldn’t have been too surprised by Bisping’s shenanigans. It was the second straight time the 32-year-old told UFC fans to take a hike during weigh-ins. “I couldn’t give a f*** about getting f*** love. All I care about is smashing this d***head’s face in. F*** you all,” Bisping stated last month after hitting the scales for his fight with Jason Miller. Bisping co-headlines “UFC on FOX” tonight opposite Chael Sonnen. The victor advances to a middleweight title bout against champion Anderson Silva.